Edge by Chef Dustin Allen Features an open kitchen that is visible from all seats in the dining room and an interactive chefs counter that allows guest the opportunity to be close to the action while interacting with Edge's staff. Edge is more than just a restaurant; it's an experience that's new and different every time you dine. While you're enjoying a wine from our extensive menu or relishing one of our signature cocktails, your server will acquaint you with the selections on Chef's ever-changing menu. Each farm-to-table dish has its own story to tell, from the local farm where the fresh vegetables were grown to the meat hand cut by Chef himself. Combining the bounty of farm-fresh, locally-grown ingredients with his elegant yet rustic style of cooking, Chef Allen prepares and presents each dish with an eclectic flair reminiscent of free-formed jazz. Six of us enjoyed dining for the first time here, and enjoyed the food, fresh, tasty and well presented. Ashley, our waitress was very friendly, helpful and attentive. This place is a gem. Food looked and tastes amazing! The atmosphere didnt match the food presentation..food was professional but atmosphere was more regular bar restraunt.. would definitely return! Drinks were amazing! My wife and I have been meaning to try out Edge for a few weeks now. Having come from Brimfield, we will return. The food was delicious, my wife had a salmon that was very good considering we are in IL and used to the coast for seafood. My plate had a pork rib that was extremely tender and seasoned well. Presentation was very good and there was minimal wait for dinner to arrive. For an appetizer, we shared effectively fried Wisconsin cheese. The breading was seasoned very well and though it may sound strange to have "cheese balls" at such a place - I can't deny how good they were. For desert, a brownie with walnuts was served - the balance between a half cooked (intentionally) middle and a crisp crust was excellent. The chocolate flavor was superb. All in all, a great restaurant that we'll return to. I do wish however that the trend of not having sound deadening materials in restaurants passes. Having a conversation when the place started to fill around 7:30 became challenging. The ceiling is open and there is no carpeting covering the polished cement floors. Its very loud for such a mid-sized place and takes away from the intimate nature they are seemingly going for. Great food and great service as always! We went there to celebrate a birthday and when we asked to get the Tasting Menu (whereby the Chef serves up an assortment of dishes) we were informed that the Chef did not want to provide that service that night and did not have the supplies to do so. We ended up ordering off the menu. The steaks had a lot of gristle, the pork chop was undercooked, and the desserts were horrible. I would have had a better cheesecake from HY-Vee. Overall this place is a disappointment. I got a reservation for Saturday night at 7pm. The location is brilliant however finding parking was a bit daunting. It was also a little confusing to get into the restaurant. Once in, I was greeted promptly and the staff were very nice. There was no wait which was a pleasant surprise. Our waitress did a wonderful job on making a suggestion for drinks and the drink selection offered something for everyone. She visited our table enough to make us feel taken care without hoovering. We ordered the steak and roasted chicken. The meats were very bland. The skin on the chicken was nicely done and it was not dry, but just lacked flavor. There was also a bramble of broccoli thrown on top of my chicken that made the plating an immediate turn off. I was so underwhelmed that I couldn't really wrap my head around the price point. The potatoes were wonderful and the greens salad was the highlight of the meal. We ordered the brownie and I was just so beyond disappointed. It tasted the same as the brownies from Pizza Hut. I was excited about the vanilla coffee sauce, but I struggled to identify any coffee flavor. The fresh cream on top was wonderful however. The seating is very close together and the noise level at a certain point was bad enough that it made it seem as though we couldn't have a conversation without yelling at one another. It also seemed to impose on other's conversations. I'm rather unimpressed that the restaurant area is on the bottom floor instead of being placed on the higher floor to be able to enjoy the view that's offered. As usual, it was a great experience! We've eaten at Edge twice within a 10 day period, each time with different guests. This experience was not quite as positive as the first, primarily because three of us ordered the pork chop - two were very good, one was fatty and full of gristle. In an attempt to avoid delaying dinner, my husband did not send back the poor quality chop so the staff did not have the opportunity to replace it. However, when he ate very little of it, the server should have asked if something was wrong. Excellent food. Chi cken enjoyed by 3. I liked the porkchop. Food was wonderful and so was service. Great night out. Amazing food and overall great experience. They also have a bar area upstairs that has a really cool chill vibe. Very cool place! Always great food with fresh and unique ingredients! We celebrated Valentine’s Day. This was a five course meal. The restaurant’s decor is trendy, but some tables are too close which makes seating awkward no space to comfortably sit or to move. Our waiter was friendly and knowledgeable, but very busy, dishes used for some courses and glasses were not removed prior placing the next course. 3 of the 5 courses were very good, the cheese plate was out of order and no explanation of the different cheeses, Those little nuances that can elevate a good to great experience were missing. The restaurant decor and location is great. However, the best part of my meal was the salad. I ordered the Tomahawk pork chop for my main course, and it was extremely fatty. I barely ate it and was very disappointed. I let our server know that the piece of meat was very fatty and she never acknowledged the issue. She took my plate and walked away. We have no plans to come back again. There are so many other better restaurants in the Heights. Food is outstanding however dessert is an after thought and tea non existent. Everything else was fabulous. This was my first time visiting this restaurant and it was my birthday which I included in the open table reservation. The menu was limited; however, the food was tasty. The Salmon and eggs was a good pairing; however, the chicken and black bean soup needed a textural component such as a dente veggies. The wine selection was pricy in contrast to the menu items. Great Birthday dinner for my mom! Food was amazing and staff made her feel special! The panna cotta was the only detractor. Everything else was excellent. Excellent food. Great service. Will recommend. Great food & service.. always an excellent experience. Always fresh, seasonal and best of local foods. Attention to detail in the meals alone is impressive but also in the service. Everything was great! Keep doing what you’re doing! Outstanding meal. Food was absolutely delightful and service was top notch. Will return soon!!! We always love our time at Edge! Food and service are always spot on. Whenever we are in a new area, I always search for "Farm to Table" and this seemed like it was going to fit the bill. It was a cold night, an early snow and we walked in at 6pm with reservations, yet no one was in the dining room. After we ordered a drink, out came delicious bread with a room temperature butter filled with fresh herbs. Yum. We chose a fig & date salad which was beyond delicious. 2 for 2. And yet we dined alone. When our main courses were served, several more diners joined us. I chose the shrimp & grits & my husband chose the pork chop. Both were generous portions and the plates were just lovely. We both sat there with moans & groans of how tasty they were. Peoria, do not miss this gem! We will be back next time we pass thru this area. The BLT was served on cold sourdough with cold bacon. The salad was served with a different dressing unsuitable for the dish. Very poor food. The wait staff tried very hard to make up the deficits from the kitchen. To chew, beyond firm, hard better discribes it. The steak was cooked to perfection (med rare). My daughters was also cooked perfectly med as ordered. She skipped the risotto and had potatoes which were nice. My husbands halibut was well cooked and he liked it but no wow factor. First time eating there was a wow. I’m very thankful our fantastic waitress Heather informed us they were down a chef as we probably wouldn’t have returned again for a long time. Now, I’m hopeful we will once again enjoy our experience there. If the sous chef or head chef is there, go! This place is fantastic. But without them it’s hit or miss. We were greeted with a friendly smile and seated right away. Our waitress was knowledgeable, made good suggestions. She was attentive despite the fact that the restaurant was busy. I had the beet salad and my wife had the fig salad. Both salads were very fresh, refreshing and tasty. I had the pork chop, it was delicious however a good portion of it was fat. Perhaps that the tomahawk style and if so then okay. 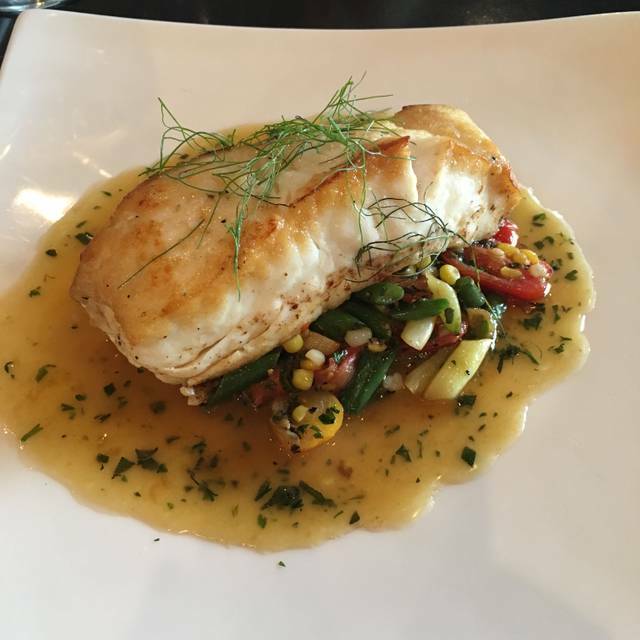 My wife had the Halibut and it was delicious as well. This was not our first time and we will return to Chef Dustin again. We've recommended it to friends and family. We found this place just by chance! We were in town for the weekend for our wedding anniversary. The service was outstanding as well as the food. I had the pasta with meatballs. Delish! My husband had the bone in pork chop and said it was the best pork chop he's ever had! The atmosphere was comfortable and we'd go back next time we come to town. Chef Dustin and his staff were incredible! We had wonderful service and suggestions from Heather and were also visited by the sous-chef. I couldn't of asked for a better experience. The food, people, knowledge, and attention to all details were impeccable! I can not wait for my next experience at EDGE.